The Parks and Recreation Department of our city offers several summer programs for kids. I'm planning to sign my daughter up for a few of them including swimming and t-ball. I played t-ball as a child and learned a lot about the fundamentals of baseball by participating. As I grew older, my love of baseball also grew. My parents took my brother and I to a Brewers major league game when we were in grade school, and I remember my excitement. Some of the more famous Brewers players were on the team including Robin Yount and Paul Molitor. When I reached high school, I enjoyed playing on the girl's softball team. Spring and summer would just not be the same without baseball. Kaskey Kids is a company that produces sport action figures. Last fall I had the chance to review the Kaskey Kids Baseball Guys toy action figure set. (Click link to read my full review.) 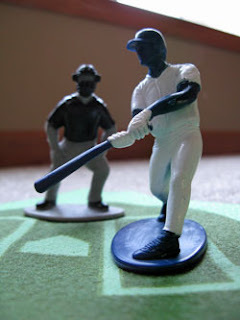 Their baseball action figure sets offer a wonderful way to explain the basics of baseball, and we're planning to use the set to prepare my daughter for her t-ball season. We wouldn't want her running the wrong way around the bases during her first game! Additionally, I'm hoping my son will love playing with the baseball guys we received last year while he watches his sister play ball this summer. The Kaskey Kids recently updated the Kid's Corner part of their website. The website now has a few fun online games to play. 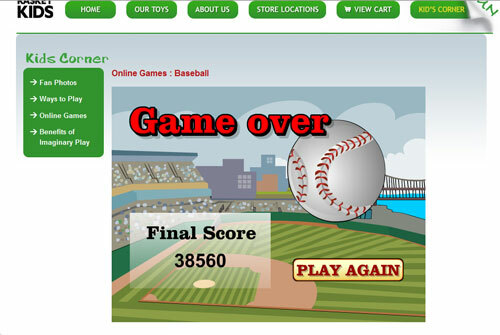 I tried out the Baseball Homerun Champion game. It's easy enough for kids to play, but adults will also find it a little challenging to see how long they can manage to continue play. I ended up with a score of 38560 my first time so you'll have to see if you can beat it. Fans can also upload their own photos that include a Kaskey Kids product on the Fans Photos portion of the website. When the photo receives 100 views it reaches "All Star" status. My favorite pictures are the ones that show the figures used as cake or party decorations. If kids need a few suggestions on ways to play with their action figures they can check out the Ways to Play section. To kick off the baseball season, the company is offering to give away one "Baseball Guys" Mini Pack to a Brimful Curiosities reader. The pack retails for $9.99 and includes 12 players in grey and black uniforms and an umpire (just enough for one team). The figures are approximately 2" tall each. The set would make a great gift for any baseball fan and encourages imaginative play. To enter, leave a comment telling me your favorite thing about the Kaskey Kids new Kid's Corner part of the website. • For contact purposes, if you are a non-blogger or your email is not accessible in your blog profile, please leave a valid email address within the comment section. • Contest ends on Monday, May 3rd, 2010 at 11:59 PM CST. • Winner will be chosen at random and sent an email notification. 1st extra entry: Blog about this contest then post your link in the comment section. 2nd extra entry: Follow me on twitter (iambrimful) and tweet about the contest. What a great site for the little sports fan. I love the different formats for kids, what a great way to learn about your favorite sport! I like that they have fan photo's. Man, my son LOVES baseball and he would totally love this. I liked the ideas for games to play with the toys..very creative. just started following you on twitter and tweeted this post! I like the fan photos section of the site. Wordless Wednesday - Worm or Flower? More contest winners to announce!